Location:30 miles from the $hit hole of Mexico. 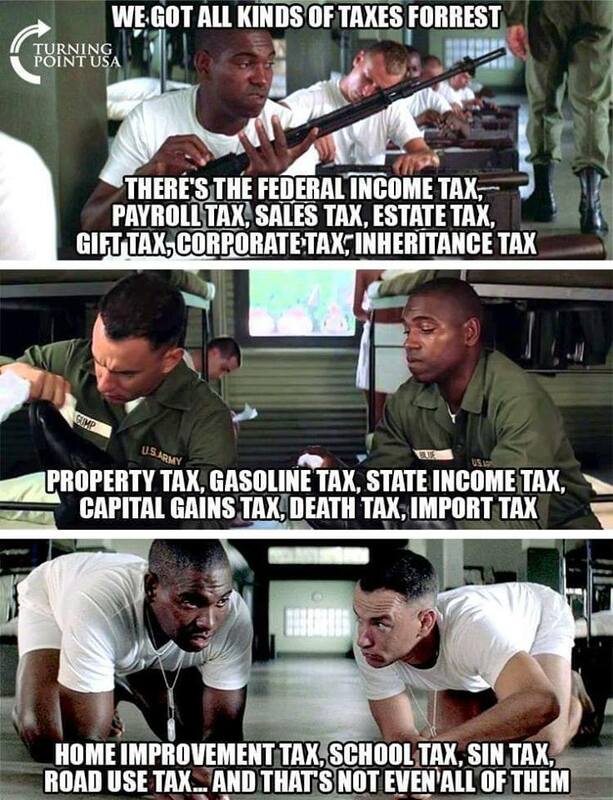 Happy tax day fellow Partiots. Taxes do nothing but rob a successful people and advance the violence brokers in Congress, while doing nothing to advance the values of our Republic. IOW Uncle Sam smiles with his hand out and behind him is a whole army of his enforcers. But it’s “volunteer” say the sheeple. Inflation and fiat “money” are among one of the worst taxes. Our Revolutionary War, among other other things, was a war against taxes. As Thomas Jefferson said, “to compel a man to furnish funds for the propagation of ideas he disbelieves and abhors is sinful and tyrannical”. Apparently I'm supporting a small village in Africa. Two grand in taxes and another fifteen hundred in estimated taxes for my wife's business. Next EBT card holder I see buying steak is getting punched in the face. I begrudgingly waited til the last minute to get my $5000 back. The new tax code worked for me. We e-filed this year, only for me to get an email about an hour ago that the returns were rejected. F'in really? I'm having to print them out and mail them in, though maybe a day late. bastiages. I deposited my two refund checks today....first time in 20 years I did not have to pay on at least one. I had to pay but done that back in February to get it over with. Yeah man I really enjoyed just paying enough taxes to buy two new cars the year I plan to retire. I'm sure the Democrats in congress after skimming their share will spend my hard earned money better than I would and while I may end up eating dog food on social security to keep from starving some illegal welfare heifer will have the good life. When I was a teenager, I dreamt of earning $30,000 a year. Now, my tax bill is well north of that. For the past few years I've always owed a lot. No idea why as my wife and I have 0 deductions on our W-4s. I guess not having kids and the downward side of a mortgage (just a couple of years left) hurts us. Even when I had a mortgage we never paid enough interest or had enough deductions to ever break minimums. We always paid at the end of the year. It wasn't until she retired and her income went down that we started to get money back on one or the other. I still pay $50 a month extra in state taxes out of my check and if I stopped doing that I would be owing $200 at the end of the year still. I still think not having and paying for kids and not paying any high interest rates was better than getting a few hundred bucks back at the end of the year.